Semantic Versioning? In Maven Central? Breaking Changes! I love the use of semantic versioning. It provides clear guidelines when an API version number should be bumped. In particular, if a change to an API breaks backward compatibility, the major version identifier must be updated. Thus, when as a client of such an API I see a minor or patch update, I can safely upgrade, since these will never break my build. But to what extent are people actually using the guidelines of semantic versioning? Has the adoption of semantic versioning increased over time? Does the use of semantic versioning speedup library upgrades? And if there are breaking changes, are these properly announced by means of deprecation tags? To better understand semantic versioning, we studied seven years of versioning history in the Maven Central Repository. Here is what we found. To understand how developers actually use versioning policies, we studied 7 years of history of maven. Our study comprises around 130,000 released jar files, of which 100,000 come with source code. On average, we found around 7 versions per library in our data set. The data set runs from 2006 to 2011, so predates the semantic versioning manifesto. Since the manifesto claims to be based on existing practices, it is interesting to investigate to what extent API developers releasing via maven have adhered to these practices. 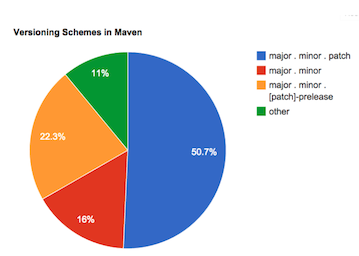 As shown below, in Maven Central, the major.minor.patch scheme is adopted by the majority of projects. To understand to what extent version increments correspond to breaking changes, we identified all “update-pairs”: A version as well as its immediate successor of a given maven package. To be able to assess semantic versioning compliance, we need to determine backward compatibility for such update pairs. Since in general this is undecidable, we use binary compatibility as a proxy. Two libraries are binary compatible, if interchanging them does not force one to recompile. Examples of incompatible changes are removing a public method or class, or adding parameters to a public method. We used the Clirr tool to detect such binary incompatibilities automatically for Java. For those interested, there is also a SonarQube Clirr plugin for compatibliity checking in a continuous integration setting; An alternative tool is japi. Interestingly, we see a very similar figure for minor releases: A little over 1/3d of the minor releases introduces binary incompatibilities too. This, however, is in violation with the semantic versioning guidelines. 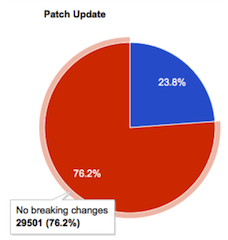 The situation is somewhat better for patch releases, which introduce breaking changes in around 1/4th of the cases. This nevertheless is in conflict with semantic versioning, which insists that patches are compatible. Overall, we see that minor and major releases are equally likely to introduce breaking changes. The graph below shows that these trends are fairly stable over time. 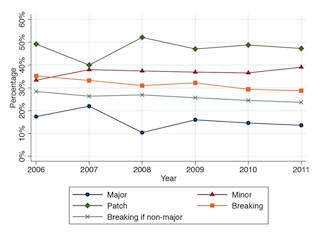 Minor (~40%) and patch releases (~45%) are most common, and major releases (~15%) are least common. 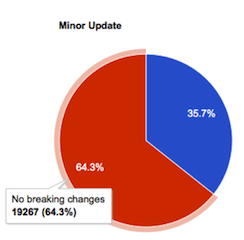 The orange line indicates releases with breaking changes: Around 30% of the releases introduce breaking changes — a number that is slightly decreasing over time, but still at 29%. Of these releases with breaking changes, the vast majority is non-major (the crossed green line at ~25%). Thus, 1/4th of the releases does not comply with semantic versioning. 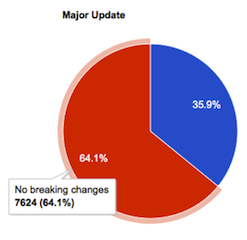 The above analysis demonstrates a deep need to introduce breaking changes: appearantly, developers wish to introduce breaking changes in 30% of their API releases. Before you completely remove the functionality in a new major release there should be at least one minor release that contains the deprecation so that users can smoothly transition to the new API. Given the many breaking changes we saw, how many deprecation tags would there be? At the library level, 1000 out of 20,000 libraries (5%) we studied include at least one depracation tag. Over 86,000 public methods are removed in a minor release, without any deprecation tag. Almost 800 public methods receive a deprecation tag in their life span: These methods, however, are never removed. That is all we found. In other words, we did not find a single method that was deprecated according to the guidelines of semantic versioning (deprecate in minor, then delete in major). Our findings are based on a somewhat older dataset obtained from maven. It might therefore be that adherence to semantic versioning at the moment is higher than what we report. Our findings also take breaking changes to any public method or class into account. In practice, certain packages will be considered as API only, whereas others are internal only — yet declared public due to the limitations of the Java modularization system. We are working on a further analysis in which we explicitly measure to what extent the changed public methods are used. Initial findings within the maven data set suggest that there are hundreds of thousands of compilation problems in clients caused by these breaking changes — suggesting that it is not just internal modules containing these changes. Last but not least, binary incompatibility, as measured by Clirr, is just one form of backward incompatibility. An API may change the behavior of methods as well, in breaking ways. A way to detect those might be by applying old test suites to new code — which we have not done yet. If you adopt semantic versioning for your API, double check that your minor and patch releases are indeed backward compatible. Consider using tools such as clirr, or a dedicated test suite. If you rely on an API that claims to be following semantic versioning, don’t put too much faith in backward compatibility promises. If you want to follow semantic versioning, be prepared to bump the major version identifier often. Should you need to introduce breaking changes, do not forget to announce these with deprecation tags in minor releases first. If you are in research, note that the problems involved in preventing, encapsulating, detecting, and handling breaking changes are tough and real. Backward compatiblity deserves your research attention. The full details of our study are published in our paper presented (slides) at the IEEE International Conference on Source Analysis and Manipulation (SCAM), held in Victoria, BC, September 2014. 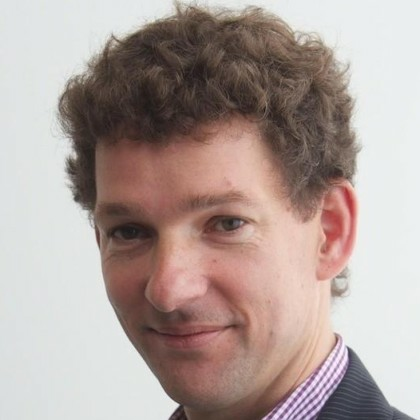 This post is based on joint work by Steven Raemaekers and Joost Visser, both from the Software Improvement Group. © Copyright Arie van Deursen, October 2014. If you are a Java developer and serious about semantic versioning, then checkout this open source semantic versioning checking tool. It is available on Maven Central and on GitHub, and it can check differences, validate version numbers, and suggest proper version numbers for your new jar release. Library Updating. Risk it Now, or Risk it Later? Chances are your software depends on external libraries. What should you do, if a new version of such a library is released? Update immediately? But what if the library isn’t backward compatible? Should you swallow the pill immediately, and make the necessary changes to your system so that it can work with the new version? Or is it safe to wait for now, and avoid immediate cost and risk? Together with Steven Raemaekers and Joost Visser (both from SIG), we embarked upon a reseach project in which we seek to answer questions like these. We are looking at library and API stability, as well as at the costs and consequences of library incompatibilities. A first result, in which we try to measure library stability, has been presented at this year’s International Conference on Software Maintenance. The corresponding paper starts with a real life example illustrating the issues at hand. The system in this example comprises around 200,000 lines of Java code, divided over around 4000 classes. The application depends on the Spring Framework, Apache Struts, and Hibernate. Its update history is shown below. The system was built in 2004. Third-party library dependencies were managed using Maven. Version numbers of the latest versions which were available in 2004 were hard-coded in the conﬁguration ﬁles of the project. These libraries were not updated to more recent versions in the next seven years. The system used version 1.0 (from 2003) of the Acegi authentication and security framework. In 2008, this library was included in Spring, and renamed into Spring Security, then at 2.0.0. As time passed, several critical safety-related bug fixes and improvements were added to Spring Security, as well as a number of changes breaking the existing API. One might argue that keeping a security library up to date is always a good idea. But since the development team expected compatibility issues when upgrading the Acegi library, the update to Spring Security was deferred as long as possible. In 2011, a new feature, single sign-on, was required for the system. To implement this, the team decided to adopt Atlassian Crowd. Unfortunately, the old Acegi framework could not communicate with Atlassian Crowd. The natural replacement for Acegi was Spring Security, which was then in version 3.0.6. However, the system already made use of an older version of the general Spring Framework. Therefore, in order to upgrade to Spring Security 3.0.6, an upgrade to the entire Spring Framework had to be conducted as well. To make things worse, the system also made use of an older version (2.0.9) of Apache Struts. Since the new version of Spring could not work with this old version of Struts, Struts had to be updated as well. Upgrading Struts not just affected the the system’s Java code, but also its Java Server Pages. Between Struts 2.0.9 and 2.2.3.1 the syntax of the Expression Language used in JSP changed. Consequently, all web pages in which dynamic content was presented uinsg JSP had to be updated. Eventually, a week was spent to implement the changes and upgrades. The good news was that there was an automated test suite available consisting of both JUnit and Selenium test cases. Without this test suite, the impact of this update would have been much harder to assess and control. This case illustrates several issues with third-party library dependencies. Third party libraries introduce backward incompatibilities. Backward incompatibilities introduce costs and risks when upgrading libraries. you control yourself but also by transitive ones you do not control. There likely will come a moment in which upgrading must be done: To fix bugs, to improve security, or when the system’s functionality needs to be extended. The longer you postpone updating, the bigger the eventual pain. As your system grows and evolves, the costs and risks of upgrading an old library increase. Such an accumulation of maintenance debt may lead to a much larger effort than in the case of smaller incremental updates. In short, not upgrading your libraries immediately is taking the bet that it never needs to be done. Upgrading now is taking the bet it must be done anyway, in which case doing it as soon as possible is the cheapest route. The full ICSM 2012 research paper. In our research project, we seek to deepen our insight in these issues. We are looking at empirical data on how often incompatabilities occur, the impact of library popularity on library stability, the effort involved in resolving incompatibilities, and at ways in which to avoid them in the first place. Stay tuned! Should you have similar stories from the updating trenches to share with us, please drop us a line! Think Twice Before Using the "Maintainability Index"
Teaching Software Architecture: with GitHub! My Last Program Committee Meeting?